Building a new playground or installing a pre-built swing set in your backyard? If so, perhaps the most important thing to consider before you build a play area for children is: “If they can, they will.” If they can climb to the top of the swingset, they will. If they can jump off the very top of the tallest tower, they will. If they can wriggle their way between railings they will. If 12 kids can jump up and down on a swinging bridge at one time, they will. If they can fly off the…. you get the point. So, please look at the project you are about to build with safety in mind. Be sure edges are not sharp, fingers cannot be easily pinched, openings in railings are either smaller than 3.5 inches or larger than 9 inches so little heads will not get stuck. Be sure that all swinging objects — like swing seats — are not too hard. Above all, be sure that there is a surface that will absorb the impact of a fall under and around any objects on which children can climb or swing. Most playground injuries are the result of falls, and it is far less costly to build a safe play area than it is to visit an emergency room. Consider where you will be locating the play area and keep an open line of sight between it and your kitchen or your deck or patio. Keep it away from roads and driveways and electric lines and your neighbor’s prize roses. Think about “curb appeal” and be considerate of neighbors. Also keep in mind how you will get the construction materials to the location. Will a delivery truck be able to back up to the site to unload lumber and gravel? BTW, depending upon the size of your yard and your DIY skills, you may want to consider a few other play area alternatives, like a simple narrow pathway that winds around your yard, or a children’s garden with fast growing bean or cucumber vines trained over the paths, or maybe a brick or turf labyrinth or maze cut into a section of your lawn. You could build a raised wooden sand table or water table on castors to make it easy to roll around your deck or patio. For something even less expensive, buy a polyethylene mortar mixing tub from your local hardware store, place it on a wooden frame with legs or a small outdoor table or some well-placed concrete blocks, and fill it with a bag or two of fine play sand — sand tables are great! A tent or a tipi or a blanket fort will keep your kids busy for hours. And, the next time you have something large delivered in a cardboard box – like a refrigerator or washing machine – don’t throw away the box, just cut out a doorway and a window or two, wrap tape around any sharp edges, and then get out the watercolors, finger paints, crayons and markers. National Program for Playground Safety (NPPS) – Located at the University of Northern Iowa and established in 1995 through a grant from the Centers for Disease Control and Prevention, the NPPS conducts research in the area of injury protection and serves as a clearinghouse for playground related safety information. Tips for Public Playground Safety (PDF) – According to the U.S. Consumer Product Safety Commission, about 200,000 children are treated every year in hospital emergency rooms for injuries related to playground equipment. This page links to various fact sheets, safety checklists, guides and handbooks, including information about various types of protective surfacing that can — and should — be used around children’s playground equipment. Recommended depths for the placement of double shredded bark mulch, wood chips, sand, and pea gravel are given for various fall heights. CCA – Chromated Copper Arsenicals – information from the United States Environmental Protection Agency (EPA) Office of Pesticide Programs about CCA and its use as a wood preservative. Changes in Pressure-Treated Wood for Residential Construction (PDF) – a publication from the USDA Forest Service, Forest Products Laboratory addressing the availability of CCA-treated wood and alternative types of treatment. California Redwood Association – trade group that promotes the use of redwood lumber for all types of projects. Find a source for redwood lumber, learn about the various grades of redwood lumber and download free plans and blueprints for building a bench, a picnic table, a gazebo, or a potting center. Project plans are also available for an Adirondack chair or swing, garden tool shed, children’s sandbox, spa surround, shade shelter, and a free-standing deck or a deck over an existing concrete patio. The Use of Recycled Tire Materials on Playgrounds & Artificial Turf Fields – information from the EPA about the use of ground recycled rubber tire material — also called “rubber mulch” or “rubber crumbs” or “tire crumb” or “crumb rubber” — that is often used as a ground cover for fall protection around playground equipment. This type of material is what was installed around the White House play set after is was installed. Note that most of the pictures you will find online show the playset before the mulch was installed. Here are a few pictures of the playground on the mulch supplier’s Flickr account. First Ever White House Playground Uses Recycled Playsafer Rubber Mulch and Rubber Curbs from Rubberecycle, As seen on 60 Minutes – a short article and a video clip featuring an interview with President Obama talking about the “swing set” installed at the White House in March of 2009. History of Mazes and Labyrinths – Jo Edkins has created a no-frills Web site with a large collection of information, photographs, and links to other maze and labyrinth resources. His site even includes instructions for designing your own unicursal maze, which has a single path to the center, or a puzzle maze that offers a choice paths – some of which may be dead-ends. Mr. McGroovy’s Box Rivets™ – How many times have you bought a big fancy toy, which took hours to assemble, only to discover that your child enjoys playing with the box more than the toy itself? Well, Mr. McGroovy (Andy McGrew) developed some very nifty plastic connectors that can be used to build cardboard play houses, castles, and forts from refrigerator boxes, washing machine cartons, or just about any heavy duty, large pieces of cardboard packing materials. These plastic rivets are easy to use, inexpensive, and reusable. The site also sells plans for different cardboard box building projects. Andy passed away a few years ago, but his wife and kids continue to sell his unique invention. Their website has an Inspiration Gallery, but the best collection of photos is on their Flickr page. Labyrinthos – Jeff Saward and Kimberly Lowelle Saward are “the co-founders and directors of Labyrinthos – the Labyrinth Resource Centre, Photo Library and Archive.” They also publish Caerdroia – The Journal of Mazes & Labyrinths. Their Web site is full of historical information, pictures, books & publications, as well as, links to maze and labyrinth locations around the world. The Treehouse Guys – This group of tree house builders, design and build custom treehouses for public parks, private camps and in the backyards of individual homeowners. 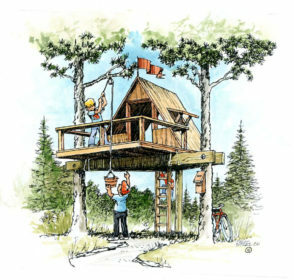 Founded as a non-profit organization known as ‘Forever Young Treehouses, Inc.’ in 2000 they are now a for profit business that specializes in universally accessible treehouses for people of all ages and abilities. Barbara Butler Artist-Builder, Inc. – these custom designed playhouses, forts, castles, treehouses, and other types of creative play structures are incredible works of art. Building a Sand Table – plans, instructions, a materials list and progress photos from HandymanWire. Sand tables are great!. If you have small kids or grand kids, a sand table should definitely be on your to-do or to-buy list. Stiles Designs – Jeanie and David Stiles have written 14 different “how-to” building project books. Their articles have been published in well-known magazines and newspapers, and they have appeared on several popular television programs. Their Web site features books, as well as, plans for storage projects, children’s furniture, garden projects and easy-to-build projects for kids. Vixen Hill – manufactures playhouses for grown-ups — gazebos, garden houses, pavilions, porch systems and shutters. Their high quality modular garden structures are prefabricated from Western Red Cedar and they can be assembled by most “handy” homeowners. They also sell an interesting modular porch system, which includes posts and removable screen, glass, louvered or paneled wall sections. Western Red Cedar Lumber Association – a Vancouver based non-profit trade association representing producers of Western Red Cedar lumber products in Washington, Oregon and British Columbia. Their site contains information about cedar products, deck design and construction, railing designs, staining and finishing cedar, fasteners and more. A companion site, Cedar Outdoor, offers basic plans and design ideas for cedar fences, gazebos, garden sheds, arbors, and playhouses. Wolman® Wood Care Products – Dr. Karl Wolman invented a process for pressure treating lumber, which eventually became known as “Wolmanized®” lumber. In 1986, the company created a new business unit, which develops various wood care products. Today, Wolman no longer manufactures chemicals for pressure treating lumber. The company has merged with Wm. Zinsser & Co. Inc., a subsidiary of RPM International Inc., which manufactures many types of specialty coatings.